by Melissa Walter. Written on 2016-08-14. Published in 2017 Issue 1. On a rainy yet warm evening, visited by dog walkers and the occasional slightest whiff of pot, nineteen of us sheltered under a white reception tent to enjoy the magic of live theater on the Spirit Square stage, a bandshell in Douglas Park, Langley. Langley is a semi-rural municipality-plus-township bordered on the north by the Fraser River and on the south by the United States of America. Its farmland slopes down from the high banks of the Fraser River towards the sea, crisscrossed by new housing complexes. Over the previous several months, sixty volunteers under the leadership of producer Diane Gendron came together to produce, direct, act, design, set-up, take down, and serve coffee for performances in three locations in Langley. This was a great show, with upbeat, contemporary song and dance in a funk idiom, and energetic, inventive clowning, and the audience loved it. Original music by musical director Lauren Trotzuk included a chorus with the words “Love's labors may be lost, but love can still be found.” This sentiment, and the community feel of the production, would be intensified on closing night when Berowne (Darcy Knopp) proposed marriage to director Mandy Dyck on final curtain call. Unlike the characters in Shakespeare’s play, the real-life lady accepted immediately. Shakespeare’s text mocks the pedantry of the Renaissance academies, which were cultural gatherings of elite men and women. The interpretation of these Renaissance academies as a cartoonish modern-day Ivy League university seemed poignant from the vantage point of this suburban park. 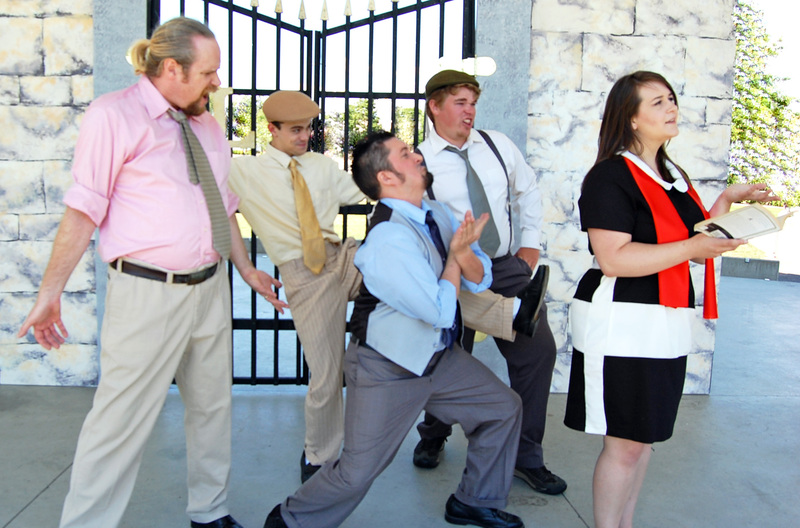 In the play’s conclusion, the men retreated behind the set’s wrought iron gates, which represented the 1950s "modern-day" Ivy League university. This imagined university, distant in time and space, ended up seeming like an aging pen for foolish male youth — neither the practical, integrated places of learning that most of these student performers experience in southwestern British Columbia, nor the real-world training ground for American elites found at Harvard or Yale today. The contrast between the gender dynamics of the imagined Ivy League setting (in fact, all-male student bodies were common in the Ivy Leagues in the 1950s, but not today) and local realities was notable. The director of this play and most of the actors were students or graduates of local universities, including prominently the University of the Fraser Valley’s theater program. Off stage, these capable young people and their colleagues — a majority of them women — combined their university education with second and third jobs as customer service agents, Walmart cashiers, mothers, and more. This play works best when the audience laughs a lot, and this specific production was funny, beginning with Jeff Hacker’s silly King Ferdinand. Taller than the others, with a little paunch and slightly stringy, longer hair, he wore a straw hat and a letterman sweater over his shoulders in regulation prep-style. His height made his high voice, rapid nods, and pleading all the more ridiculous, although ultimately, lovable: he was like a cross between a Berenstain Bear and Scooby Doo (but without Scooby’s smarts). I actually expected him to say “hu-uh?” Also, when suggesting “ entertainment ... in their tents,” he swayed his hips sideways, as if he didn't really get the point. We laughed for different reasons in response to the princess and her court. Dressed in similar sweater sets (Princess, pink; Rosaline, blue; Katharine, yellow; Maria, green), the female characters looked a little like bridesmaids, but don’t underestimate these women. Their lines are wise and witty, and Dayna Thomas’s Princess and her court did not disappoint. The Princess came across as assertive, clear, self-possessed, and gently amused, smiling at the clowns and the straight-men alike. Madison McArthur’s Rosaline was flirtatious and charming, her arched dark eye-brows matching Shakespeare’s description of the character. Ashley Tegg (Katharine) was a seriously good dancer, as was her dance partner in this show, Reilly Ellis (Dumaine). The ladies entered to an upbeat song with lyrics about “coming out,” which seemed to represent their growing ascendancy or independence. The lyrics also resonated with the fact that the clown, Costard (Annastasia Unger), was a cross-dressing lesbian in this production, dressed in slacks and a bow tie, but with her long hair in a clearly visible bun, and referred to by other characters in the feminine. This choice brought out new resonances in Costard’s lines that quibbled on different words for and definitions of women (wench vs. damsel vs. virgin). Unger was a strong performer, with exuberant physicality. In the play within the play, she dominated as Pompey, posing in a triumphant full lunge, sword to the sky. When the male characters teased her for breaking the rule of the court (not to sleep or consort with women), she showed her pride at scoring. Although, overall, the production was good-humored, when Costard was threatened with prison she didn't get any backup from the boys, and the men spoke the word “ sirrah” with a touch of irony, possibly hinting at limits on their acceptance. Don Armado’s impregnation of Jacquenetta at the end gained added bite from these gender dynamics. Again, among the primary clowns, female intelligence and awareness contrasted male silliness, as Dyck had cast women for the clever servant clowns (including Costard) and mostly men for the goofier clowns. A vivid, tiny Moth, played by Trotzuk, waited knowingly for a laugh and shared reaction shots with the audience.1 Her original songs mocked Don Armado (Luke Stevens) by saying to his face how ridiculous he is, as if her words could be hidden by the register of song. She was especially good at using physical gesture to illustrate the play’s, at times, recherché rhetoric—for instance, specifically when she acted out being the lead shot out of a gun. In contrast, a hilarious lack of self-awareness accompanied Don Armado’s bawdy gestures. He didn't know what to do with his sword. A stock comic figure that Shakespeare borrowed from the commedia dell’arte (a “Capitano,” or Spanish braggart soldier), Armado appeared in this production in a matador outfit, a very silly caricature with a Spanish accent. What was odd was that when King Ferdinand spoke of him initially, the King also used a Spanish accent. The effect was a send-up both of Spanish difference and of the white guy perceiving and constructing that difference. The juxtaposition of the Renaissance king’s hunting park with the actual Douglas Park, which is situated at the less-wealthy edge of downtown Langley city, provided a provocative, ongoing duality. The princess was expected “ here in the park,” and the wet, gold grass where the audience was sitting was the “field” where the King tried to “lodge” the princess. 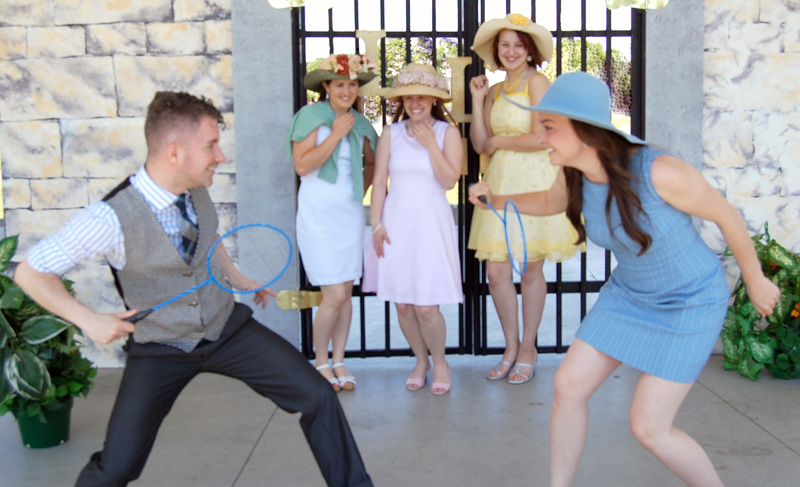 The women picnicked and played badminton in front of the stage, making the best of their exclusion from the academy. Somewhere out on 56th Avenue, a revving muscle car or motorcycle interrupted the first negotiating speech, and throughout, dog walkers on feet and in wheelchairs passed by in the background, pausing occasionally. The rain clouds dispersed and gathered again, and when the rain set in steadily with the night, the physical atmosphere underscored the darker mood at the play’s end. One of the strengths of this performance was its final shift in tone: the Princess’s realization that her father is dead was very strong, an emotional transformation that resonated through the audience. But the main strengths resulted from comic timing of the actors, and from the casting of the clever clowns as female. Although the Fraser Valley has at times been associated with an exclusionary religious fundamentalism, this latter choice revealed a contemporary acceptance of diversity in gender and sexual orientation. On a rainy night in a public park where anyone can walk by and all can enjoy, Shakespeare’s play came across as a bright celebration of love and inclusive community: energetic, youthful, and fun.